This month, #TorChat is talking to award winning science fiction authors Cory Doctorow and Charles Stross! In addition to their new collaboration The Rapture of the Nerds, Cory and Charlie will discuss science fiction, technology, and the future of publishing with Tor Senior Editor Patrick Nielsen Hayden. Come join us on September 19th, from 4 to 5 PM Eastern! Tor Books (@torbooks) is thrilled to announce the September #TorChat, part of a monthly series of genre-themed, hour-long chats created by Tor Books and hosted on Twitter. This month, #TorChat is looking at technology, both in science fiction and in the book industry itself. We’ll be chatting with two giants of the internet, science fiction, and geekery at large: Cory Doctorow and Charles Stross. Doctorow and Stross have co-authored the recently released The Rapture of the Nerds, about a post-singularity future in which Tech Jury Service members must decide about the suitability of gadgets for human consumption. Backing the technical insights and social commentary present in Rapture is the fact that these two men have their thumbs on the pulse of our internet culture. Doctorow is an author, blogger, technology activist and co-editor of the popular blog Boing Boing, where he frequently talks about issues of copyright, hacking, and his own experiences in the publishing world. His novels are simultaneously published by Tor Books and made available for free online under a Creative Commons license. Charles Stross, author of the popular Merchant Princes series (amongst others) had a convoluted road to becoming an author including a stint writing a monthly Linux column for Computer Shopper. He now regularly writes articles for other online publications and keeps a blog at antipope.org/charlie. In 2009 he made a splash at WorldCon for his widely praised dialogue with Nobel economics laureate Paul Krugman where they discussed the intersection of economics and Science Fiction. Together, Cory and Charles have a wide perspective on technology, both in publishing and outside of it. The chat will be moderated by Tor Senior Editor Patrick Nielsen Hayden (@pnh). Patrick has edited Cory’s novels since the very beginning, has worked with Charlie on a number of short-fiction pieces for Tor.com, and edited The Rapture of the Nerds for Tor Books. He is also a significant online presence himself. He and his wife, fellow editor Teresa Nielsen Hayden, blog about a wide variety of topics, including technology and publishing, at Making Light. We hope that genre fans as well as tech enthusiasts will follow the chat and join in using the Twitter hashtag #TorChat! 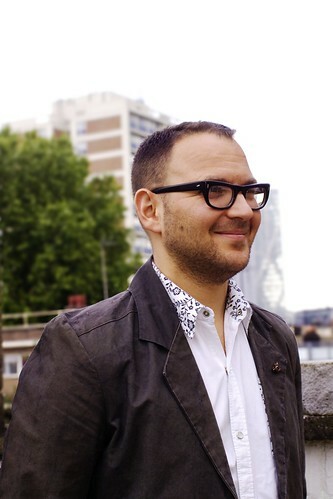 CORY DOCTOROW (@doctorow) is a science fiction novelist, blogger and technology activist. He is the co-editor of the popular weblog Boing Boing, and a contributor to The Guardian, The New York Times, Publishers Weekly, Wired, and many other newspapers, magazines and websites. He has won the Locus and Sunburst Awards, and been nominated for the Hugo, Nebula and British Science Fiction Awards. His New York Times Bestseller Little Brother was published in May 2008. A sequel, Homeland, will be published in 2013, and another young adult novel, Pirate Cinema will precede it in October 2012. His latest adult novel is The Rapture of the Nerds, co-written with Charles Stross, which published on September 4th. CHARLES STROSS (@cstross) knew he wanted to be a science fiction writer from the age of six, and astonishingly, nobody ever considered therapy until it was too late. Along the way to his current occupation, he has been a pharmacist and worked in the tech industry before becoming a freelance tech journalist. Implausibly, after fifteen years of toiling away in relatively obscurity in the fiction world, Stross’s work took off, and he now writes fiction full-time. He has sold around sixteen novels, has won a Hugo Award for his novella “The Concrete Jungle,” and a Locus Award for his novel Accelerando, and been translated into a dozen different languages. His most recent novel, co-written by Cory Doctorow, is The Rapture of the Nerds. PATRICK NIELSEN HAYDEN (@pnh), our illustrious moderator, is a Senior Editor at Tor Books. He’s also a genre fiction fan, essayist, reviewer, anthologist, teacher, and blogger. He has won both the World Fantasy Award and the Hugo Award. You can find Patrick online at Making Light, where he and his wife Teresa Nielsen Hayden, also a noted genre fiction editor, blog about a wide variety of topics, from genre fiction to the state of the world.